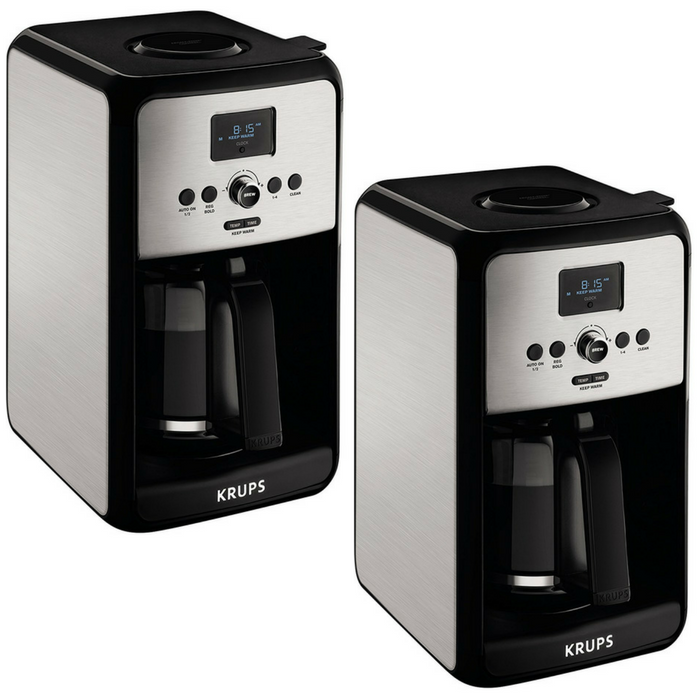 KRUPS 12-Cups Coffee Maker Just $35.99! Down From $100! PLUS FREE Shipping! You are here: Home / Great Deals / Amazon Deals / KRUPS 12-Cups Coffee Maker Just $35.99! Down From $100! PLUS FREE Shipping! Amazon is currently offering this KRUPS 12-Cups Coffee Maker for just $35.99 down from $99.99 PLUS FREE shipping! Brew up to 12 cups of great-tasting coffee with the KRUPS Savoy EC314050 programmable coffee maker. Its easy-to-read LCD screen and intuitive rotating knob allow for effortless brew-strength and keep-warm adjustments or for setting the timer. You can wake up to the aroma of freshly brewed coffee or have a fresh pot ready and waiting when you are entertaining. The coffee maker’s bold function produces a richer, more full-bodied taste, while its special small-batch setting ensures maximum flavor and aroma when brewing just 1 to 4 cups. Even more, dual program settings allow for separate weekday and weekend auto-on start times, so you can set a later brewing time on a Saturday for example.